Transformers Car Hire are able to provide a selection of vehicles as seen in the Transformers movie franchise. 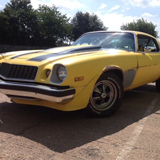 Our vehicles are some of the most screen accurate replica vehicles in the world. We offer a range of services for both fans of one of Hollywood's biggest blockbuster series and fans of a selection of American muscle cars. If you're looking to add an extra dimension to 'Transform your event', want to make an entrance to your wedding day to wow your guests or take the opportunity to spoil yourself or loved ones with an American muscle car experience, Transformers Car Hire are here to provide a memorable experience. Our vehicles have been used by a number of high profile Transformers related client and our cars are also available for hire for film and TV productions.